The answer for peak erection quality. Remember how great it felt when you were 20? It was just easier then, somehow. You know what we're talking about. We all want it. And some of us know how to get it back. It isn't the fountain of youth. It's Peak Erection Quality. For lots of us, the answer just may be Prulato. 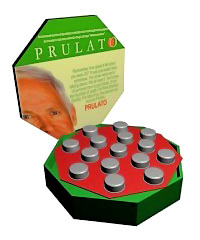 Now, there's a simple way to help maintain healthy PEQ: Prulato, the once-daily tablet for men. The Inside Scoop: Prulato should be taken as part of a healthy lifestyle and individual results may vary. AIngredient Details: Prulato proprietary blend 1,005 mg: Swedish flower pollen, ho shou wu root (Polygonum multiflorum), saw palmetto berry standardized extract, and tomato lycopene concentrate. Other ingredients: calcium carbonate, microcrystalline cellulose, croscarmellose sodium, stearic acid, magnesium stearate, and silica.